The parasympathetic nervous system is a division of the autonomic nervous system. It is involuntary, and acts with the sympathetic system to maintain body homeostasis. The actions of the parasympathetic nervous system are associated with the ‘rest and digest’ response. In this article, we shall look anatomy of the parasympathetic innervation to the head and neck – its structure, anatomical course, and its clinical correlations. The parasympathetic fibres begin in the central nervous system. The nerves supplying the head and neck are situated within four nuclei, located within the brainstem. Each nucleus is associated with a cranial nerve (the oculomotor, facial, glossopharyngeal and vagus nerves) – these nerves carry the parasympathetic fibres out of the brain. After leaving the brain, the parasympathetic fibres from each nuclei synapse in a peripheral ganglion (a collection of neurone cell bodies outside the CNS). These ganglia are typically located near to the target viscera. From the ganglia, post-ganglionic parasympathetic fibres continue to the organs in the head and neck, providing parasympathetic innervation. There are four parasympathetic ganglia located within the head – the ciliary, otic, pterygopalatine and submandibular. They receive fibres from the oculomotor, facial and glossopharyngeal nerves (the vagus nerve only innervates structures in the thorax and abdomen). We shall now examine these ganglia in more detail. Note: Most ganglia are associated with some sensory and sympathetic nerves – these do not synapse in the ganglia, they merely travel through it. Fig 1.0 – Overview of the parasympathetic supply to the head and neck. The ciliary ganglion is located within the bony orbit. It is situated anteriorly to the superior orbital fissure, between the lateral rectus muscle and the optic nerve. Pre-ganglionic fibres: The ciliary ganglion is supplied by fibres from the Edinger-Westphal nucleus (associated with the oculomotor nerve). Post-ganglionic fibres: The parasympathetic fibres leave the ganglion via the short ciliary nerves. These fibres continue into the orbit to innervate structures of the eye. Target Organs: The post-ganglionic fibres from the ciliary ganglion innervate the sphincter pupillae (contracts the pupil) and the ciliary muscles (accommodates for near vision). Sensory fibres from the nasociliary nerve (a branch of the ophthalmic division of the trigeminal nerve) – innervate the cornea, ciliary body and iris. Fig 2 – Overview of the oculomotor nerve branches. The parasympathetic fibres to the ciliary ganglion have been highlighted in green. The pterygopalatine ganglion (also known as sphenopalatine) is the largest of the four parasympathetic ganglia. It is located within the pterygopalatine fossa – a space located inferiorly to the base of the skull, and posteriorly to the maxilla. Pre-ganglionic fibres: The pterygopalatine ganglion is supplied by fibres from the superior salivatory nucleus (associated with the facial nerve). 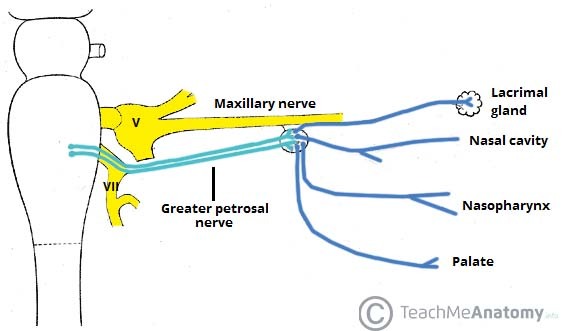 These fibres travel within the greater petrosal nerve and the nerve of the pterygoid canal to reach the ganglion. Post-ganglionic fibres: The parasympathetic fibres leave the ganglion by hitch-hiking on branches of the maxillary nerve (derived from the trigeminal nerve). Target organs: The post-ganglionic fibres from the pterygopalatine ganglion provide secretomotor innervation to lacrimal gland, mucous glands of posterosuperior nasal cavity, nasopharynx, and the palate. Sympathetic fibres from the internal carotid plexus and sensory branches from the maxillary nerve pass through the pterygopalatine ganglion without synapsing. Fig3 – The pterygopalatine ganglion and its banches. 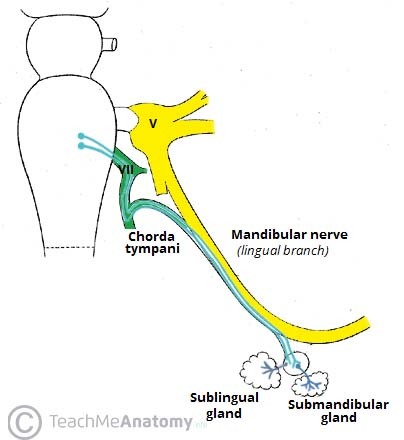 Fig 4 – The submandibular ganglion. The submandibular ganglion is located inferiorly to the lingual nerve, from which it is suspended. Pre-ganglionic fibres: The ganglion is supplied by fibres from the superior salivatory nucleus (associated with the facial nerve). These fibres are carried within a branch of the facial nerve, the chorda tympani. This nerve hitch-hikes along the lingual branch of the mandibular nerve to reach the ganglion. Post-ganglionic fibres: Fibres leave the ganglion and travel directly to the submandibular and sublingual glands. Target Organs: Secretomotor innervation to the submandibular and sublingual salivary glands. Sympathetic fibres from the facial artery plexus pass through the submandibular ganglion. They are thought to innervate glands in the base of the oral cavity. The otic ganglion is located inferiorly to the foramen ovale, within the infratemporal fossa. It is medial to the mandibular branch of the trigeminal nerve. Pre-ganglionic fibres: The ganglion is supplied by fibres from inferior salivatory nucleus (associated with the glossopharyngeal nerve). Parasympathetic fibres travel within a branch of the glossopharyngeal nerve, the lesser petrosal nerve, to reach the otic ganglion. Post-ganglionic fibres: The parasympathetic fibres hitchhike along the auriculotemporal nerve (branch of the mandibular division of the trigeminal nerve) to provide secretomotor innervation to the parotid gland. Target Organs: The post-ganglionic fibres from the otic ganglion provide innervation to the parotid gland. Sympathetic fibres from the superior cervical chain pass through the otic ganglion. They travel with the middle meningeal artery to innervate the parotid gland. The ciliary ganglion provides innervation to the sphincter pupillae muscle, which acts to constrict the pupil. If the ciliary ganglion is damaged, there is a loss of innervation to the sphincter pupillae. This results in a permanently dilated pupil that does not constrict in the presence of light. This is known as Adie’s pupil – named after the British neurologist William John Adie. Adie’s pupil is thought to result from inflammation caused by a viral or bacterial infection. Which of the following is NOT a parasympathetic ganglion of the head? Which nerve is associated with the superior salivatory nucleus?